Physical Description:  p., col. ill., 28 cm. 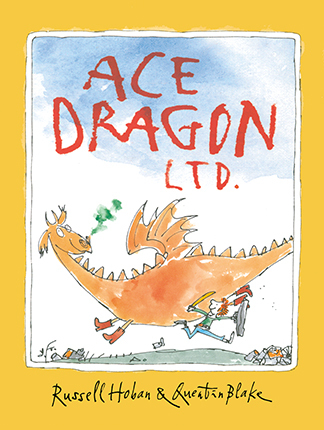 The story of an unusual friendship between a boy and a dragon named Ace. Booklist - 11/01/2015 *Starred Review* Outfitted in a green shirt with a sword tucked into his belt, John walks down the street only to be stopped by the klonk of a manhole cover inscribed with the words, “Ace Dragon Ltd.” A quick conversation through the cover—it’s too heavy to lift—reveals the following: Ace is a dragon of limited abilities, and the duo should go flying—but only after they fight. John agrees to meet Ace for battle but wonders, “How shall I know you?” To which the dragon replies, “I’ll be wearing two pairs of Wellingtons.” Naturally. The two face off in gleeful combat, depicted through action frames rendered in Blake’s characteristic loose ink lines and watercolor splotches. John then climbs on the marigold-hued dragon’s back, and they take to the skies, only to get stuck on a golden moon. It takes one of Ace’s unusual talents to get back to Earth, proving he is “not so limited” after all. 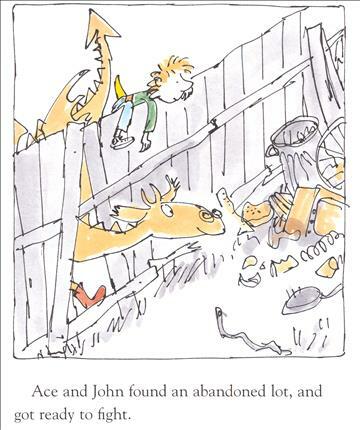 Hoban’s skill at crafting stories for children is on full display in this tale, which is wonderfully endowed with a childlike acceptance of the fantastic, and Blake’s jovial illustrations complement it perfectly. Together they tell a story where impossible things can happen and you can still be home in time for dinner. Originally published in 1980, this marks the book’s U.S. debut. - Copyright 2015 Booklist.